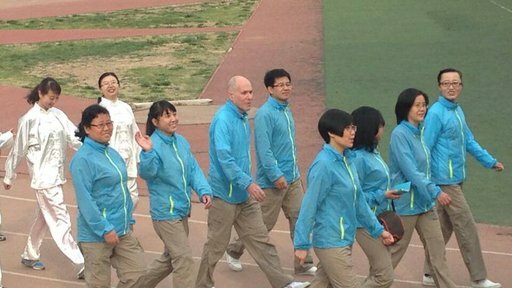 Lawrence Kahn marches in a Sports Day celebration with members of the English department at his university site in Lanzhou. Integration into a foreign culture means fitting in. It means making both myself and my hosts feel comfortable with my being here. It does not mean totally becoming one with the culture and losing my identity as an American. An interesting tradition in Chinese culture is arguing about who will pay for a meal at a restaurant. I’ve learned that even if one loses the fight of who will pay, it’s important to at least make the effort. Sometimes I hang tough and other times I back down. Sometimes, I get downright sneaky and arrive at a restaurant early. I pay and ask that the change be brought to me at the end of the meal. Although my acquaintances try to grab the bill when it comes at the end of the meal, they soon learn that the battle has already been lost when the waitress brings the change and the receipt. In some ways, as a “Life Experienced Volunteer” in China, aspects of my fitting in may be easier than that of a younger Volunteer. Age is respected in China. I have a lifetime of experiences to share. People are interested in listening. I enjoy working and teaching. I have traveled and will travel in the future. My hosts observe that my energy level in the classroom is high. They accept all of this, even though it is different from Chinese culture. When I first arrived at the university where I was assigned to work as an English teacher, people would grab my arm at the elbow as I was about to climb some stairs. The same thing happened when hiking a mountain with a group of students. Again, this was part of showing respect for the elderly. Understanding this, I went with the flow until people saw that physically my health was still quite robust. Lawrence Kahn with his counterpart at a university of Chinese medicine. Being a “Life Experienced Volunteer” has made it easier to interact with colleagues like fellow teachers and administrators, even though they may be younger than me. At the same time, younger volunteers may find it easier to interact with students outside of class, as they are closer in age. Having said that, a “Life Experienced Volunteer” may be seen in a role similar to that of a parent, someone who can give advice about life to students; it’s been possible to interact with small groups of students in lunches where we can exchange thoughts in both English and Chinese, hiking or ping pong. I took up ping pong about two and a half years ago. My Chinese colleague/partner/friend/ping pong teacher later confided to me that he wanted to train me to become good enough to push him to improve. He was successful. We are fairly equal and often split the games we win. One evening recently, we ended up winning nine games each. We competed in a staff team competition, my first ever. I got trounced by some very good players. My teammate gave me some advice for one match and the match was actually competitive. Although I lost, my opponent later came to me and said he’d like to practice with me anytime. Lawrence Kahn competes in a faculty team ping pong competition in April 2017. People at the competition saw that I was trying to fit in by playing the national sport. A colleague later told me that many people in the physical education department were watching and were quite interested in my match. “The foreign teacher’s forehand is not bad, but his backhand needs some work” became the topic of discussion. 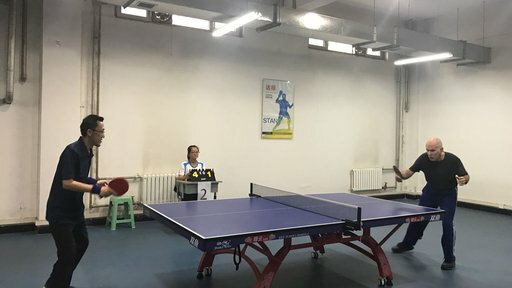 Subsequently, my fellow colleague/ping pong teacher and I were invited to practice with the university ping pong team once a week, competing internally for ranking on the team. I was able in my final weeks to get ranked as high as #14 out of 21 players. 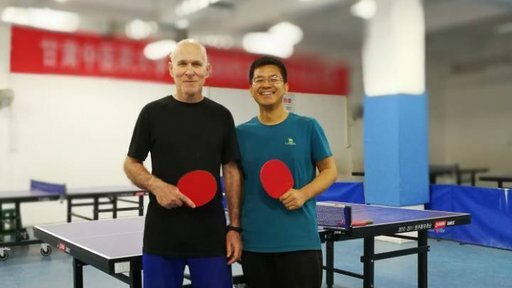 Although my ping pong is not that good, and I have a lot of weaknesses, it was the effort that allowed me to integrate into the community both with students and faculty. My ping pong friend and I decided to play five games one evening after practicing. He had a good night, winning the first four games. I jumped out to a 2-0 lead in the final game and had a gut feeling that he was either losing concentration or starting to get tired. A year or two ago, he would sometimes ease up while playing to build my confidence. He eventually learned I didn’t like this. I said that I wanted him to concentrate in the final game. If I won, I would treat him to lunch. If he wanted to treat me, then he would have to complete the sweep of five games. He focused but in the end, I won. He wasn’t happy that I would be treating him to lunch. This was, though, part of the game of “Who will treat whom?” and fitting in. And I didn’t have to sneak into the restaurant in advance to pay the bill. Lawrence Kahn served as a volunteer from 2014-17 in Lanzhou, the capital of Gansu province in China, where he taught English at a university of Chinese medicine. He was a volunteer in the Philippines from 2010-13. A graduate of the University of Connecticut, he taught tennis professionally internationally for 20 years, and has been teaching English as a Second Language for 15 years.